The federal budget is the government's estimate of revenue and spending for each fiscal year. The revenue for most governments comes from taxes. These include taxes on family incomes, business profits, and imports, such as custom duties and tariffs. It also includes sin taxes on activities the government wants to discourage, such as cigarette smoking and alcohol use. The government imposes use taxes on activities, such as gasoline, to pay for related activities, such a building roads. Pigouvian taxes impose costs on those who impose damages to society. An example would be a tax on manufacturers that pollute rivers. Some countries derive revenues from state-owned businesses, such as oil companies. The revenue from these companies supplies revenue directly to these governments. Federal spending is on activities that benefit the public good. Almost all governments spend on public safety and defense, transportation, and trade. Most also provide some social welfare payments, whether for unemployment compensation, retirement, and health care. The amount spent reflects the values and priorities of the society. When the government spends more than it takes in, it's known as deficit spending. It creates a budget deficit. A reduction of revenue with tax cuts also creates deficits. Each year's deficit is added to the sovereign debt. Both are tools of expansionary fiscal policy. They expand the economy by pumping more money into it. The money is borrowed from the future. If done right, an expansionary policy will boost the economy enough to easily pay off the debt when it comes due. If done poorly, it will saddle future generations with an unsustainable debt load. You can find out if a country has a sustainable debt load by looking at its debt-to-GDP ratio. GDP stands for gross domestic product. It measures each year's total economic output. A healthy debt-to-GDP ratio should be 77 percent or less, according to the World Bank. Spending that's lower than revenue creates a budget surplus. Tax increases can also create a surplus. Both are used in contractionary fiscal policy to slow economic growth. That removes money from the current economy in return for paying off future debt. A budget surplus heads off a dangerous bubble when the economy is in the boom phase of the business cycle. It's also needed when the debt-to-GDP ratio is greater than 100 percent. Another term for contractionary policy is austerity measures. The U.S. federal budget is the amount of spending and revenue for the next fiscal year of the U.S. government. It runs from October 1 through September 30. The U.S. federal budget has two categories of spending that are unusual. The mandatory budget pays for benefits established by prior Acts of Congress. These include Social Security, Medicare, Medicaid, and other such benefits. This budget estimates the costs to administer the benefits. It cannot be changed without another Act of Congress. 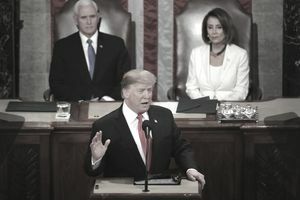 The authorization law requires that the U.S. Congress appropriate funds for current mandatory spending to keep mandated programs, such as Social Security, running. The interest on the national debt must also be paid, although it's not part of the mandatory budget. If the interest is not paid, then the United States has defaulted on its debt. The other category is discretionary spending. Most of this goes toward the military budget, the second-largest budget after Social Security. The rest funds management of all other government agencies. These include Health and Human Services, the Justice Department, and the U.S. Treasury. Congress determines current discretionary spending for each fiscal year. Rising mandatory spending on Social Security, Medicare, and the like. Increased military spending that was kicked off by President Bush’s War on Terror. The 2001 recession and the 2008 financial crisis slowed growth and cut tax revenue. The 2009 Economic Stimulus Act that ended the Great Recession. Three tax cuts by presidents Bush, Obama, and Trump cut revenue. You can argue over which president contributed the most to the deficit. The truth is that they all did. The current U.S. federal budget breakdown explains how the combination of budget components and the national deficit impacts the U.S. economy. The Constitution gives Congress the power over the federal budget. Article 1, Section 9, states, "No money shall be drawn from the Treasury, but in Consequences of Appropriations made by Law." The president's role is to submit a budget proposal to Congress. He asks all federal agencies to submit their budget requests to him. The Office of Management and Budget compiles these requests. The president submits this budget to Congress. Congress usually follows this budget as a guideline to create its own budget resolution. That is used to create the appropriations bill. These bills allocate funds for different categories of government agencies. The budget process lasts 18 months. Here's the schedule for the FY 2020 budget, the third one to be submitted by President Trump. Early fall: Federal agencies submit budget requests to OMB. November: OMB sends its comments back to the agencies. December: Agencies submit the final budget request to OMB. January: OMB submits the budget to president. February: President submits the budget to Congress. Trump did so in March. April 15: Congress prepares its Budget Resolution. June 10: Congress creates Appropriation Bills. June 30: House approves all bills and submits them to the President. September 30: All bills must be signed into law. This budgetary process was set into law by the 1974 Budget Control Act. But Congress doesn't always follow the schedule. When that happens, then Congress submits a continuing resolution to keep the government running until a budget is approved. When that doesn't happen, the government shuts down.